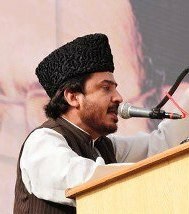 Renowned leader of Millat e Jaffaria Pakistan ,a sincere son of millat and a true soldier of Imam-e-Zamana (a.t.f.s) Allaama Aftab Hyder Jaffri embraced Shahadat in Saddar area today shortly when yazidi terrorists opened fire on him and his colleague Mirza Shahid Ali near Parking Plaza . The incident occur when the two were going to their office in the early morning ,they were employees of a leading private bank. Shaheed was particularly known for his great motivational speeches and had a charismatic ability to control crowds espcially in pressure and highly charged situations . Almighty Allaah had blessed him with a unique capability and wit to discipline angered mobs . He was among those rare sincere people who are always seen at the fore front whenever any tough time was faced by momineen. His shahadat is a heart rending incident but his sincere life for Ahlul bayt is a testimony that it is a very well deserved Shahadat for a true follower of Imam e Zamana (a.t.f.s). Mirza Shahid Ali Also embraced Shahadat. 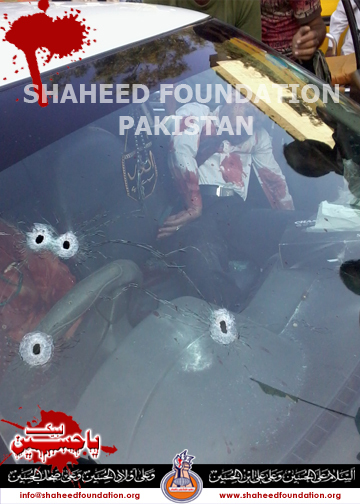 The bodies of Shohada had been shifted to Jinnah Hospital earlier . 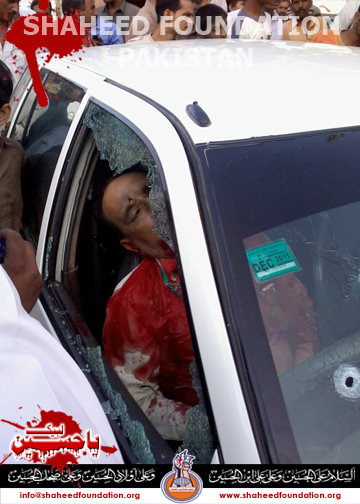 Npw the bodies have been shifted to Fatimiyah Ghusal Khana near Nomayesh Chowrangi. Allaama Aftab Hyder Jafri was a popular Zakir-e-Ehle-Bayt (AS) and had tirelessly served the millat for long years. He rendered valuable services to millat from the platform of Jaffaria Alliance Pakistan for some time . Currently he was serving in the newly formed shia religio political entity Majlis-e-Wahdat-ul-Muslimeen ,as an office bearer in the Karachi Division of the organisational structure. Please recite a fateha for Shaheed Allaama Aftab,Shaheed Shahid and Shohada e Millat e Jaffaria Pakistan.